India said on Wednesday that it had downed a Pakistani jet in an “aerial engagement” with the Pakistan Air Force, but also lost one of its own planes. 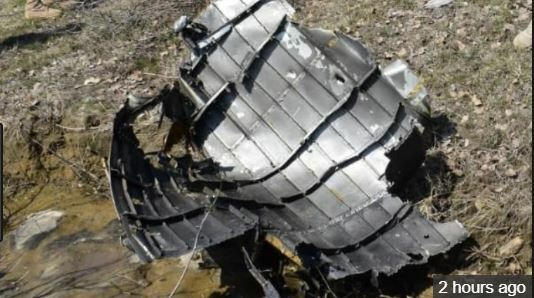 A photo of plane wreckage surrounded by Pakistani military personnel is of an F-16 shot down by an Indian MiG-21 fighter, the Indian Air Force (IAF) has confirmed. The IAF has said the Pakistani aircraft fell in Pakistan-occupied Kashmir. Pakistan denied that it used F-16s, made by US firm Lockheed Martin, on Tuesday. Here is the photo of the wreckage. Tensions between India and Pakistan have escalated since Jaish-e-Mohammed, a Pakistan-based terrorist group, carried out a suicide bomb in Jammu and Kashmir that killed 40 CRPF soldiers on February 14. Both New Delhi and Islambad have said they carried out airstrikes on each other’s soil in the past two days. India announced a pre-emptive counter-terrorism operation against JeM in Khyber-Pakhtunkhwa province on Tuesday. It said on Wednesday it had thwarted Pakistan’s attempt to target its military installations, while Islamabad claimed it had shot down two Indian jets. India also acknowledged that an Indian pilot was missing on Wednesday, but did not name him. Pakistan said he was arrested, identified him as Wing Commander Abhinandan, and released videos of him in custody.